Intrest, Interesting Information, All Interesting Facts. resolution is 240X400 pixels. 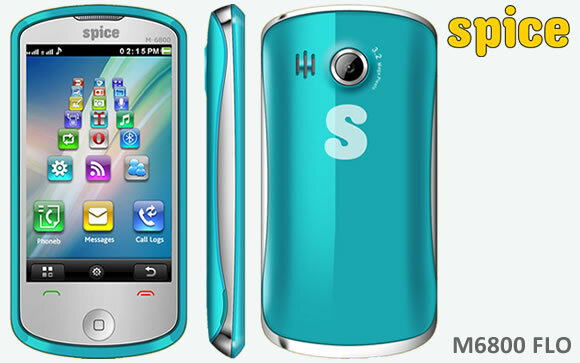 Spice M-6800 mobile phone is a dual band GSM mobile phone and its dimension is 107.8×53.6×12.5 mm. It is a very light weight mobile handset of company. Its weight is 91 grams. Spice M-6800 mobile phone has a good battery back up with battery of 1000 mAh. Stand by time is up to 250 hours and talk time is up to 4 hours. As like above there are many other features make this Spice M-6800 very attractive for users. It has a good quality 3.2 MP Camera. Spice M-6800 mobile phone makes sure to capture various moments of life of users. Audio player and Video player are also available. Audio and video player make it so entertaining for customer. It has 3D User interface and wireless LAN which make it very modern handset. EDGE, GPRS, Opera 10 are also available for various uses. Stereo Bluetooth is also available in this mobile phone. FM is another nice feature of Spice M-6800 mobile phone with FM alarm and FM recording. Its internal memory is 43.8 MB which can enhance by up to 8 GB external memory card. Various types of applications also associated with this Spice M-6800 FLO. Alarm clock, calendar, calculator, Email, games, incoming call guard, Java support, world clock, voice memo, To-do list, caller group, unit or currency checker, auto power on/off etc. are common feature of this mobile phone. Spice M-6800 FLO in Indian market available on Rs. 4300/-, which is a very affordable price for middle class people according to its features. Life without humor is really very boring. Today our life has become so busy that we have forgotten to laugh. A joke is a very effective tool to make anybody laugh. Even in most serious situations these jokes can make you giggle. Such is the power of joke. Joke is basically a paragraph with funny side and ends with a punch line. These jokes come in various forms and are meant for the purpose of entertainment only. Some jokes can be based on stereotypes of some ethnic community. But it is not meant to hurt the feelings of such community. Marwari jokes are quite famous throughout the country and they are based on the stereotypes of Marwaris. Marwari jokes are one of the most popular ethnic jokes of India. These Marwari jokes portray Marwari as a miser and most of these jokes are based on it. Marwaris are basically from Rajasthan and are one of the most successful communities of India. Marwari jokes can be in different languages such as Hindi, English or Marwari. Some of these jokes are quite common and have been heard many times. But there are many new jokes which are yet to be heard. There are many unknown people who are gifted with the talent of forming new jokes. Every day new jokes are formed and they are as humorous as old jokes. Many publishing houses publish books with Marwari jokes on regular basis and one can buy such books from a book shop. These books can be easily availed from any book shop in the market, railway station or a bus station. In the age of internet one can easily enjoy reading such jokes on certain blogs or websites. There are numerous websites and blogs which provide us with various Marwari jokes. Those who like to read Marwari jokes will not be disappointed at all. These jokes are available in Marwari language too. Marwari Jokes stand to their reputation and can make anybody laugh. little water gatka and fir wapas bhatka.